Hashemzadeh, K., Sahebari, M., MoeiniNodeh, M., Rezaieyazdi, Z., Shariati, Z., Mirfeizi, Z. (2018). The importance of synovial adiponectin values in patients with rheumatoid arthritis in comparison with osteoarthritis. Rheumatology Research, (), -. Kamelia Hashemzadeh; Maryam Sahebari; Mohammad MoeiniNodeh; Zahra Rezaieyazdi; Zhaleh Shariati; Zahra Mirfeizi. "The importance of synovial adiponectin values in patients with rheumatoid arthritis in comparison with osteoarthritis". Rheumatology Research, , , 2018, -. Hashemzadeh, K., Sahebari, M., MoeiniNodeh, M., Rezaieyazdi, Z., Shariati, Z., Mirfeizi, Z. (2018). 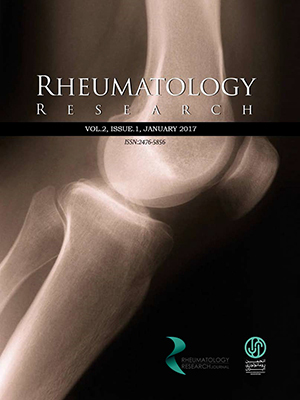 'The importance of synovial adiponectin values in patients with rheumatoid arthritis in comparison with osteoarthritis', Rheumatology Research, (), pp. -. Hashemzadeh, K., Sahebari, M., MoeiniNodeh, M., Rezaieyazdi, Z., Shariati, Z., Mirfeizi, Z. The importance of synovial adiponectin values in patients with rheumatoid arthritis in comparison with osteoarthritis. Rheumatology Research, 2018; (): -. Introduction: The purpose of this case control study is to investigate the serum and synovial fluid adiponectin levels in 33 patients with rheumatoid arthritis (RA) and 26 patients with osteoarthritis (OA) as the control group. Material and Methods: A venous blood sample was collected from each patient in fasting condition for measurement of plasma adiponectin. At the same time synovial fluid was aspirated from the swollen knee joint of all patients and controls aseptically. Blood and synovial fluid samples were centrifuged at 5,000 rpm for 5 min, then freezed and stored at -20°C. For analysis of the data, we used independent t test, Mann- Whitney test, Kolmogorov-Smirnov test, Pearson’s correlation and linear regression analysis.